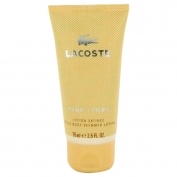 Lacoste Pour Femme was launched a year after the launch of Lacoste for men in 2003. The creator of this perfume is Olivier Cresp. The fragrance is, as well as the entire brand, very comfortable, naturally elegant and sporty. Catharine Hurley is walking on the table this commercial probably known to all symbolizes spontaneous beauty, easiness, and freedom of the scent and the woman who wears it.